during the NASCAR Camping World Truck Series UHOH 200 at Bristol Motor Speedway on August 16, 2018 in Bristol, Tennessee. Photo by Brian Lawdermilk/Getty Images. As the NASCAR Camping World Truck Series completed their 16th race of the season, the 2018 Truck Series Playoff grid is set and eight drivers will compete for the championship beginning at Canadian Tire Motorsport Park on Sunday, Aug. 26. 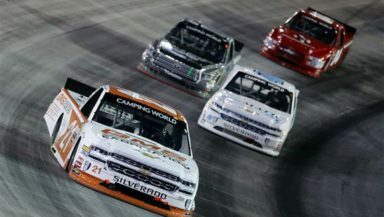 While a familiar foe ended up in victory lane at Bristol Motor Speedway Thursday night, others who needed a strong night got their wish and some had their best career finish. Here’s a look at this week’s power rankings. Noah Gragson – Gragson finished ninth in the first stage, but did not collect any points in Stage 2. But, he did come back to finish ninth for his 12th top-10 of the year and is now in the Playoffs. He’ll be seeded in the third position. Brett Moffitt – After a thrilling win at Michigan the week before, Moffitt and the No. 16 team was brought back to reality on Thursday night. He had a tough qualifying outing by qualifying in the 14th position. Not all was lost, however, as he was able to finish third in Stage 2. But the night continued to get worse for the Hattori Racing team as they continued to slip back and finish in the 18th position. With four wins this year, Moffitt is now locked into the Playoffs and is seeded in the second position.